Lynx Melody Too was cloned from Lynx Melody, a cutting horse legend and American Quarter Horse Association Hall of Fame member. Lynx Melody won the 1978 National Cutting Horse Association (NCHA) Futurity and 1979 NCHA Derby, and in 1980 was named NCHA World Champion Mare. 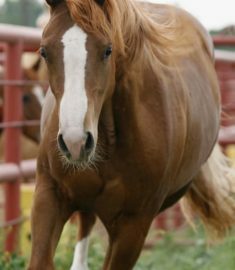 She was also the only Futurity Champion to ever foal another Futurity Champion; her offspring, Shania Cee, won in 1999. All together her offspring won more than $1.3 million. “Every one of her foals was a money earner,” says Jason Abraham of Abraham Equine. In 2004, two weeks before her death at age 29, her owner Gregg Veneklasen, DVM, collected a tissue biopsy to preserve her genetics. In 2007, Lynx Melody Too was born, making Lynx Melody the oldest horse ever cloned and the first horse cloned post-mortem. Lynx Melody Too lives on Abraham’s Canadian, Texas, ranch. “It gives you goose bumps to see the similarities between her and the original,” says Veneklasen, who co-owns her with Abraham.